At the beginning of the 20th century in Japan, O-Take-San, a Japanese young lady, falls in love with an American official. This relationship will be filled with social and religious impediments that will threaten the couple's happiness. This is one of the minor films (with difference) of the German moviemaker, Fritz Lang. Inspired by John Luther Llong and David Belasco's "Madame Butterfly", "Harakiri" is above all, the triumph of the art direction that shines specially in this Nippon fable in a majestic and suggestive way. 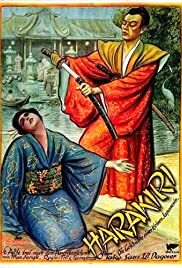 "Harakiri" it is not any big and lost Fritz Lang's masterpiece. Thanks to its discovery our idea about the evolution of the posterior career of the German filmmaker has been destroyed. However, this film confirms us Lang's control of story telling, his talent for the construction of narrative and, above all, to validate in a manner, the extraordinary themes consistent in his work. We encounter in this movie a more naturalist visual conception of the cinema, rather than those works of his contemporaries. The scenery never tries to overlap reality, but in a certain way, tries to remake it. This film was particularly eulogized for the critics of that time for the detail of the nature and the recreation of the Japan of that time. Lang had the invaluable help of the Ethnographic Museum of Berlin, and thanks to this, and on the fact that the director knew by heart oriental civilizations, at the end the result was this film that has to be taken in account as an early Lang. It is possible to find as well in "Harakiri" certain features very recognizable in his later works, like the theme of love fighting against the external circumstances that try to obstruct its success ("Der Müde Tod" as a perfect example). In this film, love is jeopardized by the social conventions which find their confirmation into the figure of Bonzo; adding another aspect, the religious one, to those dangers that hunt the main characters. And now, if you'll allow me, I must temporarily take my leave because this German Count must considerer putting into practice those strange and peculiar Japanese customs, that is to say, "Harakiri" due to the remaining days of Christmas preparations.